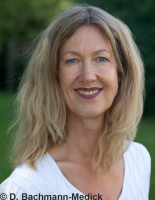 Doris Bachmann-Medick is Senior Research Fellow at the International Graduate Centre for the Study of Culture (GCSC), Universität Gießen. She held numerous appointments as a visiting professor, recently at the universities of Graz, Göttingen, Cincinnati and the UC Irvine. Her main fields of research are cultural theory, cultural studies, literary anthropology, and translation studies. Since 2012 she has cooperated with Topoi in exchanging thoughts and analytical perspectives on questions of cultural theory and possible connectivities between ancient studies and contemporary approaches in the study of culture. The main focus in this exchange has been on the applicability of cultural turns or recent scientific concepts and methods of culture (such as translation, space/border, identity, comparison, scaling). Doris Bachmann-Medick is member of the Topoi Think Tank (Key Topic Identities). She is also member of the Expert Council on Cultural Education of the Mercator Foundation. Besides she serves on the editorial board of the publication series “Repräsentation – Transformation. representation – transformation. représentation – transformation: Translating across Cultures and Societies”. She is also consultant editor of the journal “Translation Studies” and coeditor of the publication series “Concepts for the Study of Culture (CSC)”.